Esmeralda Djali Willow Tree Figgy Pudding. Esmeralda Djali Willow Tree Figgy Pudding. Esme. I would call your complete name often in all its' lyrical familiarity and you would always come running to me, especially when I would playfully demand, "Where are you?" and "What took you so long?" You were eleven years old when you left us on Wednesday the 16th of August and I'm still trying to understand what happened. Didn't we make a pact that you would live well into your twenties? You were and always will be my, Tiny Dancer ; four tiny, wee pounds of unwavering loyalty and love, dancing around me like ethereal wisps of light and air, lifting me up every single day of your life. It's fair to say you only had eyes for me and my eyes in turn sought yours out whenever I could throughout the day to confirm that , dare I admit it out loud? You were my oyster with not one grain of sand in it, like my other equally cherished pets who had come before you and who are with me now, nor were you my oyster with two grains of sand. You were my necklace of pearls. . . no, still that is not enough. You were a thousand pearls strung together to form a cloak that shielded me from loneliness and reminded me that love and gentleness can be reciprocated. You were an uncommon gift from nature, a treasured gift from the great spirit above. You slept with me, curled up in my arms, every single day of your life. You weren't in my arms the night before we had to say our last good-bye. The next morning, the morning you left , you summoned all your remaining strength and you jumped onto the bed as if wanting to remedy that small infraction. I placed your frail body in the middle of the bed and covered you in blankets. I lay next to you and sang you our song. I sang over and over until the words felt empty, until I felt empty knowing what was to inevitably come. I left you to get a glass of water. When I returned, your spirit was gone. You had managed to slip out from under the covers in the middle of the bed and you had made your way to the upper part of the bed, to the spot where you had lain next to me every single night for the eleven years of your life. I wrapped you in blankets again and curled around you. I sang the song. I sang the song I sang every night before we would fall asleep. I sang the song one last time." Who loves you pretty baby? Who's going to hold you through the night? Who loves you pretty baby? Who's going to love you all your life?" Esmeralda Djali Willow Tree Figgy Pudding. 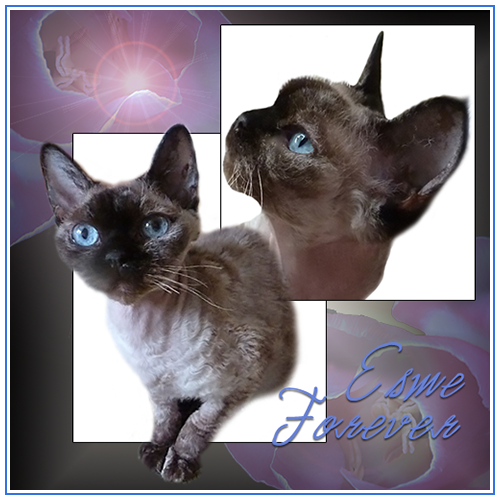 Esme. My Tiny Dancer. How fortunate were we to be in the world, together, at the same time.